2012 to date has been the worst year for motorcycle sales in over a decade according to vehicle check website Cartell.ie. In a press release issued today, the company digs into the numbers and the picture they paint is not a happy one. 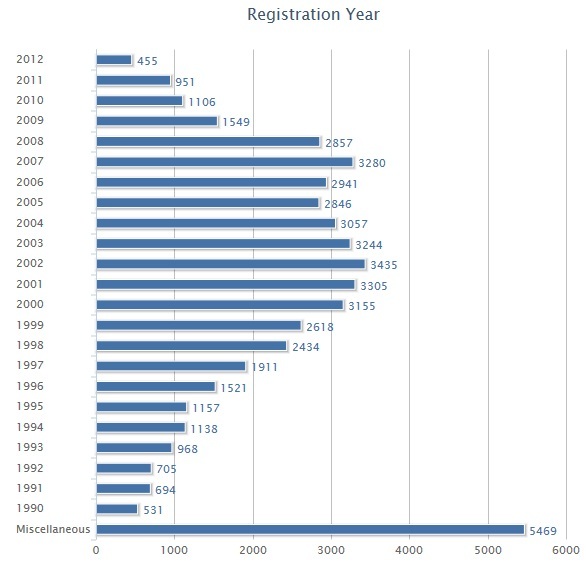 Highlights include the following graph which shows Irish motorbikes by registration year currently in Irish fleet as of October 2012. The authors examine some of the reasons for the collapse, notably the recession. We would suggest that the punitive rates of VAT on protective equipment and the recent budgetary increases in fuel costs and motor tax may also be contributory factors to the collapse in sales. Interestingly, Cartell.ie reports that over half (52%) of the 51,174 bikes on the roads are imports.